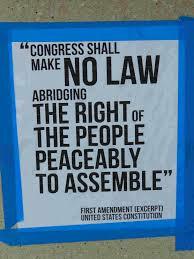 The First Amendment to the U.S. Constitution is the first in the Bill of Rights. It provides citizens with the following freedoms: religion, speech, press, peaceable assembly, and a right to “petition the Government for a redress of grievances.” James Madison drafted amendments one through ten that constitute the Bill of Rights and this initial one was adopted on December 15, 1791 with virtually no recorded debate to provide documentation of the true intentions of the text. An early court case to challenge the religion clause was McCollum v. Board of Education. This case was decided on March 8, 1948 by the U.S. Supreme Court. It was the earliest test of the separation of church and state in schools. The case was brought against the school by an Atheist whose son attended the public school in Champagne County, Illinois. She claimed that her son, James, was criticized for not attending religious classes on school property, during school hours that were led by local clergy. McCollum asked school officials to stop offering the religious teachings during school. After being ignored, she filed the lawsuit alleging a violation of the principle of separation. The classes were found to be unconstitutional in an 8 to 1 opinion. A later case in 1952, Zorach v. Clauson, found religious classes that did not use school facilities or public funds to be constitutional. This topic remains one of the most political charged and issues still today. Gitlow v. New York was the first major First Amendment case argued by the American Civil Liberties Union before the U.S. Supreme Court as a press issue. Benjamin Gitlow, a member of the Socialist Part of America, was charged for publishing “Left Wing Manifesto.” He was sentenced to 5 to 10 years in prison for violation of New York’s Criminal Anarchy Law of 1902, a law passed after the assassination of President William McKinley by an anarchist. 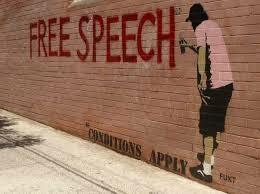 The law prohibits individuals from distributing inciting speech. Gitlow argued that he could freely disseminate the published material which he claimed was for information purposes versus advocating violence against the government. The U.S. Supreme Court upheld Gitlow’s conviction with a 7 to 2 decision on June 8, 1925. This case set the precedent for enforcement at the federal and lower levels of government. Previously, states could pass legislation that was more restrictive than the federal level. One of the earliest Supreme Court cases involving the freedom of assembly was Edwards v. South Carolina. A group of 187 civil petitioners met at Zion Baptist Church in Columbia, South Carolina to peacefully protest. They were non-violent, yet were arrested. In an 8 to 1 decision, the court ruled that South Carolina had tried to silence the group unjustly. Each of these cases was argued as a violation of the First and Fourteenth Amendments. The latter is a much lengthier text and is commonly used to provide equal protection under the law. The text that spells that out is: “nor shall any State deprive any person of life, liberty, or property, without due process of law; nor deny to any person within its jurisdiction the equal protection of the laws.” The legal definition of “liberty” is still being argued today. This article discusses the rights contained within the first amendment to the United States constitution. It also provides three instances in which the federal or state government violated the first amendment. Why do people and businesses keep challenging the laws if decisions have already been made about how to interpret them? That’s a good question. One reason is that political thoughts and opinions do change in the country. Supreme Court justices are chosen by presidents and it is common knowledge that the current Supreme Court is a conservative leaning court. Therefore, it makes sense that citizens who may want prayer in schools or want religions teachings at their public school might actually have a shot at this court interpreting the religious verbiage more loosely than previous courts. Some say yes while others say no. 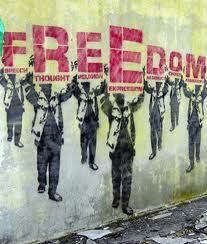 Those that say yes will argue that there are abuses to the freedoms. For example, there have been several Supreme Court cases regarding whether speech that incites violence is still permissible as “free speech.” If a freedom is harming someone else, should it remain legal? Where in the constitution would the Founding Fathers have ever granted anyone the privilege of hurting another? They wouldn’t. So, there are limits to freedoms. There are limits to regulations placed on individuals also. Having too many rules and regulations can be just as dangerous as not having enough. The flip-side to that argument is that in this country, we are all guaranteed those inalienable rights regardless of the location where the interfering legislation was passed. Any law passed that prohibits citizen’s privileges will likely be struck down. What makes you qualified to discuss these issues? While as an American citizen, I am afforded these rights as an individual and it is my responsibility to understand them. In addition to simply being born here, I also have an extensive background in constitutional law. A country without such individual protections as those discussed here would be a very dangerous place.